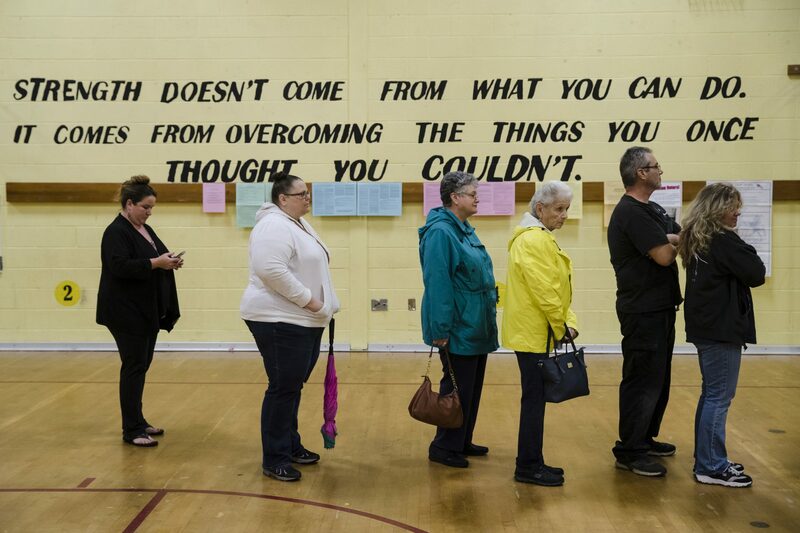 Voters wait in line to cast their ballots on election day in Fairless Hills, Pa., Tuesday, Nov. 6, 2018. 2018 election results: Pa. goes blue statewide. But purple in Congressional races. Two years ago, Republicans won 13 out of 18 House seats in Pennsylvania. Dems hoped to make big gains. Inside a northern York County restaurant called Boomerang, Bill Gramlich watched the election returns and felt stressed. At one point, the crowd cheered — and he thought that meant the race had been called in favor of his candidate. “Well, that was close,” Gramlich said. “They didn’t call that,” his friend said. Gramlich, a 54-year-old construction contractor, described himself as a conservative. He supported U.S. Rep Scott Perry in the 10th Congressional district, which remained close as the night went on Tuesday evening. Two years ago, Pennsylvania Republicans enjoyed election night. The GOP nominees for president and U.S. Senate both won the state. And Republicans won 13 out of 18 Congressional seats. But this year, the Republican candidates for governor and U.S. senate trailed in the polls by double-digits against the Democratic incumbents. And a new map of Congressional districts from the Pennsylvania Supreme Court made several House races much friendlier to the Democrats. Ahead of Tuesday’s voting, forecasters gave Democrats and Republicans good odds of an even 9-9 split in Congress. As election returns came in Tuesday evening, Democratic incumbents U.S. Sen. Bob Casey and Gov. Tom Wolf were declared the winners relatively early. 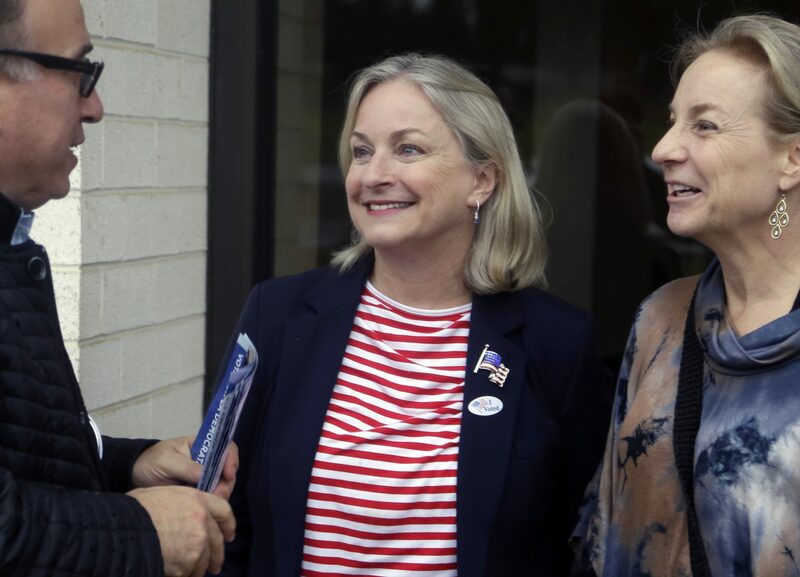 Several important congressional races remained too close to call into Tuesday evening. But shortly after 11 p.m., cheers erupted at Boomerang, as Perry announced that his Democratic opponent had conceded. By early Wednesday morning, The Associated Press called nine races for Republicans and nine for Democrats. In the interactive map below, you can see which Congressional candidates won — and by how much. Republican Congressman Lou Barletta challenged Democratic U.S. Sen. Bob Casey Jr., who was first elected in 2006. WASHINGTON (@AP) — Democrat Bob Casey of Pennsylvania wins third Senate term, beating Republican Rep. Lou Barletta. Green Party candidate Neal Gale and Libertarian Dale R. Kerns Jr. were also on the ballot. The Associated Press called the race in favor of Casey. Republican Scott Wagner, a former state senator, challenged Democratic incumbent Tom Wolf. Both are wealthy businessman from York County. Wagner’s running mate late for lieutenant governor was Jeff Bartos. John Fetterman was Wolf’s running mate. Also on the ballot: Green Party candidate Paul Glover, Libertarian Ken V. Krawchuk and their respective running mates. WASHINGTON (@AP) — Democratic Gov. Tom Wolf of Pennsylvania re-elected, defeating Republican Scott Wagner. The Associated Press called the races in favor of Wolf. This election, Republicans were mostly playing defense when it comes to Congressional seats in Pennsylvania. And Democrats targeted a number of seats for a pick-up. Here’s a look at some of the key ones. PA Post will be adding information about more races as the night goes on. 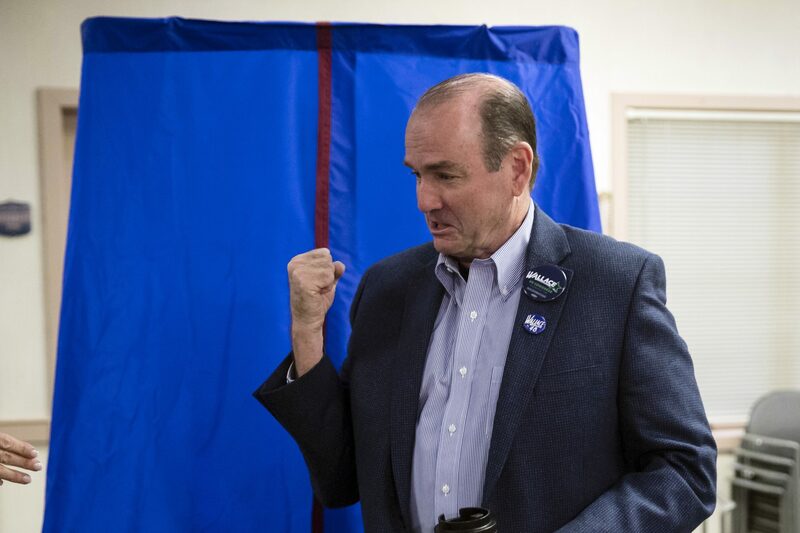 The candidates: Democrat Scott Wallace, a wealthy philanthropist, challenged Congressman Brian Fitzpatrick. Fitzpatrick is a former FBI agent and federal prosecutor. During the campaign, Fitzpatrick emphasized moderate positions he’s taken, such as opposing repeal of the Affordable Care Act and supporting increased gun restrictions. At one debate, he even told Wallace not to say the word “Republican.” Wallace linked Fitzpatrick to Republican President Donald Trump and House Speaker Paul Ryan. 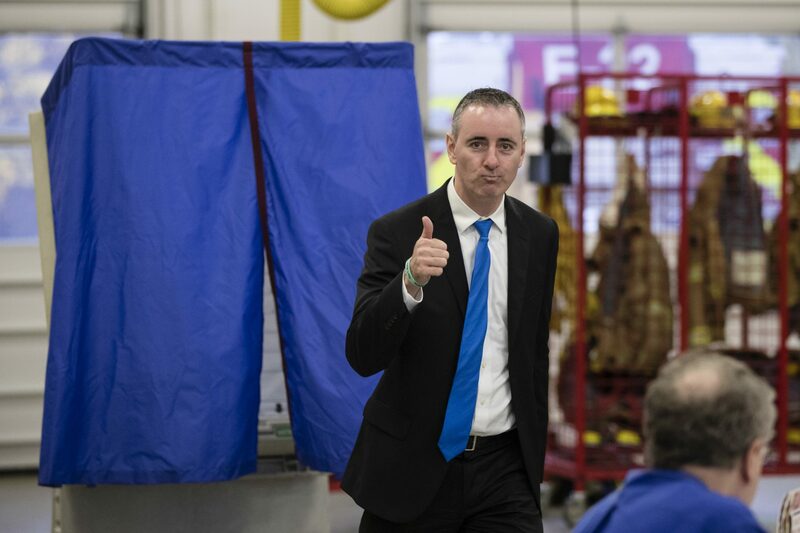 Democratic candidate for Pennsylvania’s 1st Congressional District Scott Wallace gestures afters after casting his ballot in Buckingham, Pa., Tuesday, Nov. 6, 2018. Cheers erupt at Fitzpatrick HQ with folks saying he’s beat Wallace. Fitzpatrick’s campaign was celebrating late Tuesday evening, and The Associated Press called the race for him. The candidates: Democrat George Scott, an Army veteran and Lutheran minister, challenged U.S. Rep. Scott Perry. Perry, a former state lawmaker, was first elected to Congress in 2012. Perry is an Iraq war veteran who was promoted to brigadier general in the Army National Guard in 2015. 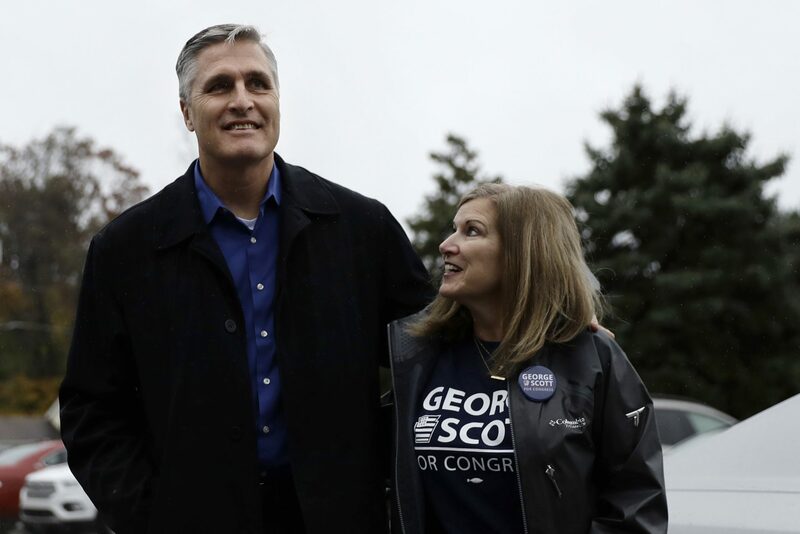 George Scott, left, Democratic candidate for Pennsylvania’s 10th Congressional District, and his wife, Donna Scott, walk to vote at Celebration Community Church, Tuesday, Nov. 6, 2018, in Dillsburg, Pa. The Associated Press called the race for Perry. The candidates: Democrat Susan Wild, the former solicitor for Allentown city; Republican Marty Nothstein, a Lehigh County commissioner and an Olympic gold medalist for cycling; and Libertarian Tim Silfies. All three were running for an open seat, following the resignation of former U.S. Rep. Charlie Dent, a Republican. The Associated Press called the race for Wild. 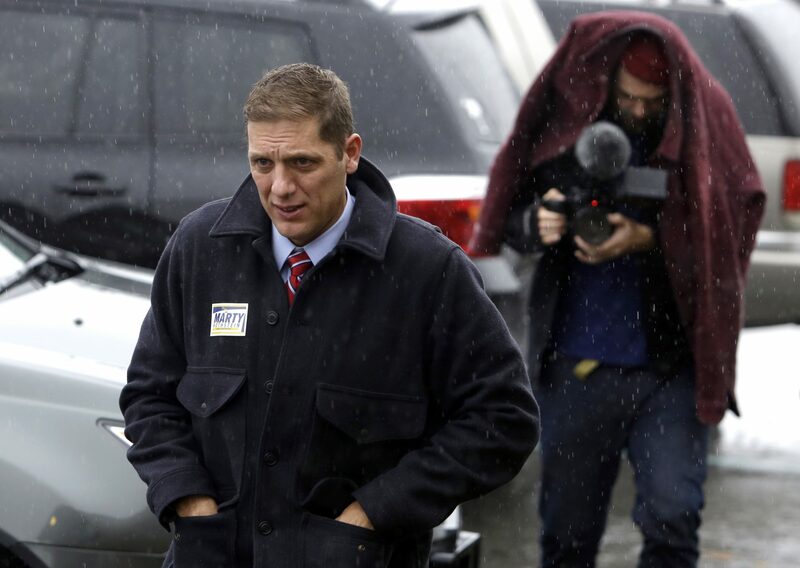 Marty Nothstein, Republican candidate in Pennsylvania’s 7th Congressional District, arrive at his polling station to vote Tuesday Nov. 6, 2018, in New Tripoli, Pa. Nothstein is facing Democrat Susan Wild for the seat held by Charlie Dent who retired. The candidates: Republican Mike Kelly, whose family has a long history in the car dealership business, was first elected to Congress in 2010. Democrat Ron DiNicola, a Marine veteran and attorney, challenged him. A third candidate, Libertarian Ebert Beeman, was also on the ballot. The Associated Press called the race for Kelly. The candidates: U.S. Rep. Lloyd Smucker, who was first elected in 2016; and Democrat Jess King. The district: Lancaster County, plus part of York County.